I love falafels just about any way I can get them. In a salad, in a pita – even on their own. They’re just magnificent balls of goodness. Although the ingredients list for this recipe is rather huge, don’t let that scare you, because this is really such a simple dish to prepare. It’s perfect for lunch or dinner! If you want to bake the falafels instead of frying, you can do that. Bake at 350F for about 20 minutes (turning halfway through cooking). These falafels are melt-in-your-mouth delicious! In a high-powdered blender or food processor, pulse chickpeas until they are chopped up very small. Add garlic, onion, parsley, cumin, coriander, baking soda, salt, lemon juice and water. Pulse until all ingredients are mixed together well. Transfer to a large bowl, then add flour, flax egg, sesame seeds, chia seeds and hemp hearts. Mix well. You should be able to form them into small balls. If not, add a bit of water, just a tablespoon at a time, until you get the right consistency. Start rolling all of your falafel balls and set them onto a cookie sheet. Place in the refrigerator for about 30 minutes. Once your falafels have firmed up a bit in the fridge, heat a large skillet over medium heat. Add enough oil to over just over half of the falafels. Once oil is heated, carefully add the falafels to your pan, just a few at a time, until browned on the bottom, then flip over and wait for the other side to brown. Repeat until all falafels are cooked. Add all ingredients to a jar and shake well. Place in the refrigerator until you're ready to use it. Divide salad greens, tomatoes and cucumbers among 4 salad bowls. 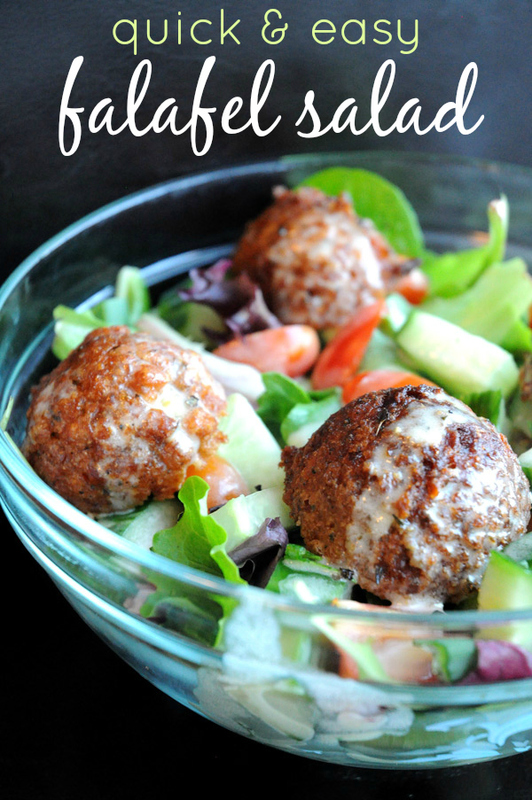 Top with fried falafels, then drizzle on your dressing and serve. If you want to bake the falafels, you can do that. Bake at 350F for about 20 minutes (turning halfway through cooking).